The discovery of huge amounts of water ice and possible organic compounds on the heat-blasted planet Mercury suggests that the raw materials necessary for life as we know it may be common throughout the solar system, researchers say. Mercury likely harbors between 100 billion and 1 trillion metric tons of water ice in permanently shadowed areas near its poles, scientists analyzing data from NASA’s Messenger spacecraft announced Thursday (Nov. 29). Life on sun-scorched Mercury remains an extreme long~shot, the researchers stressed, but the new results should still put a spring in the step of astrobiologists around the world. “The more we examine the solar system, the more we realize it’s a soggy place,” Jim Green, the director of NASA’s Planetary Science Division, said during a press conference today. The observations by Messenger, which has been orbiting Mercury since March 2011, provide compelling evidence that reflective patches first spotted near the planet’s poles by the Arecibo radio telescope in Puerto Rico two decades ago are indeed water ice, researchers said. 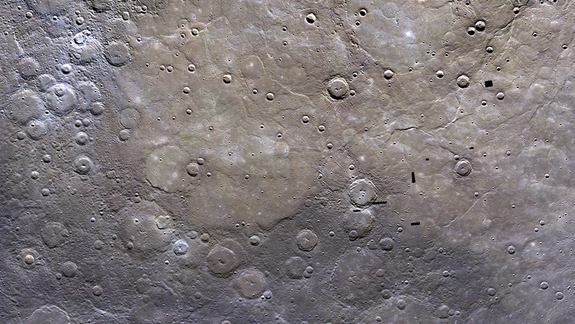 In the coldest parts of Mercury — permanently shadowed regions where temperatures drop to perhaps minus 370 degrees Fahrenheit (minus 223 degress Celsius) — this ice can lie bare and exposed. But Messenger’s data also show that much more frozen water is found in slightly warmer areas, buried beneath a strange dark material that acts as an insulator. This dark stuff is likely a mixture of complex organic compounds, the carbon-containing building blocks of life as we know it, researchers said during Thursday’s news conference. “This organic material may be the same type of organic material that ultimately gave rise to life on Earth,” said Messenger participating scientist David Paige of UCLA. Mercury probably acquired much of its water and organic material the same way Earth did, researchers said — via comet impacts and asteroid strikes. Ice and organics are common on the frigid bodies in the solar system’s outer reaches. “There’s a lot of water out there, as there is a lot of water around other stars, but at substantial distance,” said Messenger principal investigator Sean Solomon, of Columbia University’s Lamont-Doherty Earth Observatory. With its ultra-thin atmosphere and proximity to the sun, Mercury is probably not a good bet to host life as we know it. But finding ice and organics there should still inform the hunt for organisms beyond Earth and aid scientists’ quest to learn more about how life took root on our planet. “The history of life begins with the delivery to some home object of water and of the building blocks, the organic building blocks, that must undergo some kind of chemistry, which we still don’t understand on our own planet,” Solomon said. Follow SPACE.com senior writer Mike Wall on Twitter @michaeldwall or SPACE.com @Spacedotcom. They’re also on Facebook and Google+. It may be a scorching hot chunk of ice close to the sun, but NASA’s Mercury-orbiting probe, Messenger, says frozen water is located in regions of Mercury’s north pole that always are in shadows. The water almost certainly came from impacting comets, or possibly asteroids. Ice is found at the surface, as well as buried under a dark material. Just in time for Christmas, scientists have confirmed a vast amount of ice at the north pole — on Mercury, the closest planet to the sun.The findings are from NASA’s Mercury-orbiting probe, Messenger, and the subject of three scientific papers released Thursday by the journal Science.The frozen water is located in regions of Mercury’s north pole that always are in shadows, essentially impact craters. It’s believed the south pole harbors ice as well, though there are no hard data to support it. Messenger orbits much closer to the north pole than the south. The ice is thought to be at least 1 1/2 feet (0.3 meters) deep — and possibly as much as 65 feet (20 meters) deep. There’s enough polar ice at Mercury, in fact, to bury an area the size of Washington, D.C., by two to 2 1/2 miles (3.2 kilometers) deep, said Lawrence, the lead author of one of the papers. “These are very exciting results,” he added at a news conference. 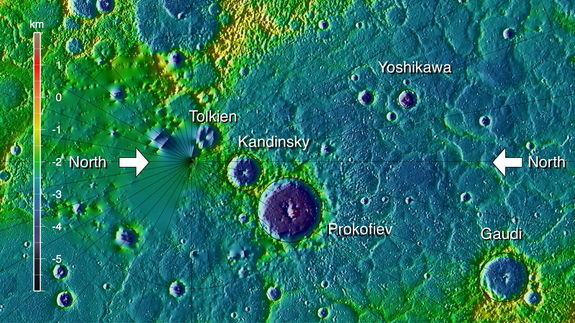 For two decades, radar measurements taken from Earth have suggested the presence of ice at Mercury’s poles. Now scientists know for sure, thanks to Messenger, the first spacecraft to orbit Mercury. The water almost certainly came from impacting comets, or possibly asteroids. Ice is found at the surface, as well as buried under a dark material. 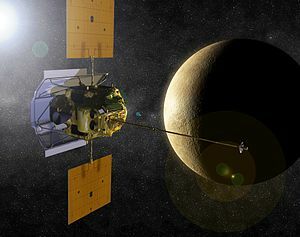 Messenger was launched in 2004 and went into orbit 1 1/2 years ago around Mercury, where temperatures reach 800 degrees Fahrenheit (426 Celsius). NASA hopes to continue observations well into next year. Columbia University’s Sean Solomon, principal scientist for Messenger, stressed that no one is suggesting that Mercury might hold evidence of life, given the presence of water. But the latest findings may help explain how water and other building blocks of life arrived elsewhere in the solar system, he said. Mercury is becoming the subject of new interest “where it wasn’t much of one before,” Solomon said.